I don't have much time left here on the computers today but I did want to share a quick story of something that happened this week. We were planning on meeting with one of our recent converts this past week. On our way to the chapel where we would meet with him, he texted us and said that he had two more people who were coming with him that were going to be interested in the church. This mother and daughter are separated and have been for about 13 years but have finally found one another. The mother is living in a shelter and the daughter is in a foster care system. They find time to hang out every week or so together. We were able to talk to them and share our message with them. They were very interested in what we had to say and were excited to hear more. When we asked for their information, we learned of both of their circumstances and they both said they were not allowed to have visitors where they were staying. Instead, we would set up meetings like this where we would meet at a chapel somewhere to teach them and to read with them. It was a great blessing to have found these two. If it weren't for our member helping us and introducing us, we would have never found these two. As a mission, we have discovered that investigators that we find through member referrals are 2.5 times more likely to be baptized and join the church. As missionaries, we rely heavily on members to help us meet with investigators and find new investigators. I know that there was much more missionary work I could have been doing even before my mission. I implore that you seek out and pray for opportunities to do missionary work whether that is going out with the missionaries in your area, referring them to a friend, or just opening your mouth about the gospel. You do not need a name tag to partake in this glorious work. I love you all and I thank you again and again for your love, support and prayers! Aloha family, friends, and loved ones. Richmond has been amazing so far. We've gotten to meet so many amazing people and I am really beginning to love the area and people. This week, we had an amazing experience during stake conference. We couldn't figure out where we wanted to sit for a really long time. We finally decided to sit near the entrance. Just before it started, we had a member walk up to us with a gentleman and she said he had just walked in and was looking for a church to attend. We were super excited. As he got up to leave, we stopped him and asked if we could share a message with him. He readily agreed. We had a very solid lesson with him and he accepted a baptismal date for February 12th. His name is Lewis. It is amazing to see how many people the Lord has prepared for us. We need only find them. Often times, they end up finding us. Now, you ain't gonna believe this but my bag got stolen out of our car...again. This time, they broke the back window and grabbed them out. We've had a trash bag taped on to keep rain out this past week. My companion's bag was found and turned in to the Visitor's Center. My bag is still at large. I'm sure they will turn up and if they don't, I am sure that they will have an impact on someone else's life that will be much needed. I love this area, I love my district. It is an honor to serve these elders. They are each hardworking, faithful, and obedient missionaries. I love you all for your love and support! Aloha, Family and Friends and Hau'oli Makahiki Hou! This New Year started out with quite a few changes! I got transferred into the Concord Zone. I am serving in the Hilltop ward out in Richmond. I am serving as a District Leader in my district. Aaaaaaaand we got to watch Star Wars 7: The Force Awakens for New Years! We went to a member's house to watch it and were able to finish it as well as Zootopia. 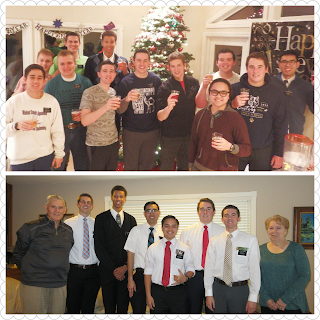 Before we left, we had a little countdown (at 8:50pm) and toasted to the new year. It was midnight somewhere. This week, we were able to go around and contact a few referrals. We have found a new investigator named Olivia whose friend met with missionaries out in Sacramento. She had sat in on some of the lessons and gone to church with them. She seems very nice and was very excited to meet again. Church was almost reduced to a one hour block because the water got shut off but luckily it came back on before sacrament meeting finished. We have a lot of families from Hawaii but I haven't been able to meet too many as many families weren't there this week due to the holiday. New Year's Eve, we got to play an age old American classic game of "Were those fireworks or gunshots?" My new companion is Elder Peterson and he is from Enterprise, Utah. 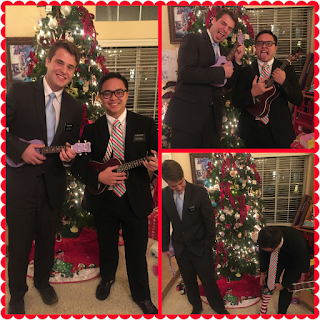 He is a very hardworking Elder and we have been getting along very well. I look forward to serving the people of Richmond. I know that our Heavenly Father has many great and wonderful things in store for each of us this new year. I love you all so much! I'll attach some pictures in a separate email-oh WAIT. Camera's still gone hahaha oh well. I'll have to improvise, I guess. 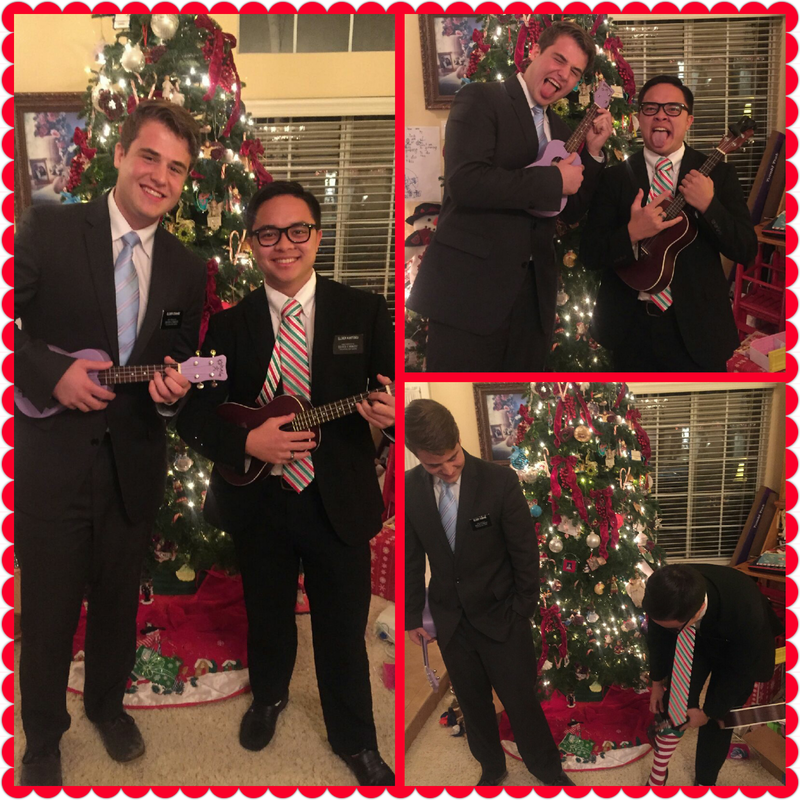 Our family was able to google chat with Elder Kaitoku on Christmas Day. It was nice to share the day with our family and both grandmothers. He is doing well and enjoying his mission very much. He told us he would be transferring out of the area and going to Richmond. We are so grateful for the blessings of the gospel and thank all of you for your prayers, letters, well wishes and gifts. We thoroughly enjoyed our time with him and the kids enjoyed talking to him as well. We know that his desire to serve a mission has greatly blessed our lives and continues to strengthen our family. We hope that by sharing this blog with you, you too will be enlightened, uplifted and inspired by the messages and experiences shared by our missionary. We invite you to find out more about the Savior ad hear about a the plan of salvation, the plan of happiness that is available to all. We know that this church is true and believe that Jesus Christ is the Savior of the world. It is through his love and sacrifice that we can see and be with our family and loved through the eternities. Don't have a ton of time on the computers today but I DID want to wish you all a very Merry Christmas! Being on the mission, I've been very disconnected from social media, the outside world, and many other things. One thing that I've come to appreciate about that is avoiding the very commercial side of the Christmas season. I've really been able to delve deep into the true meaning of Christmas not only this month but all my mission long. I invite you all to remember the true meaning of Christmas. I encourage you to watch the "Light the World" video that the church has put out and share it with your friends or on social media. Be the light of Christ for someone. I love you all! Have a very Merry Christmas and a Happy New Year! PS For our New Years P-day, we are allowed to watch 2 movies as a zone/district and our President has authorized Star Wars: The Force Awakens!!! WHOOOOOO!! !